Plagued with attendance problems, the 1984 Louisiana World Exposition has the distinction of being the only exposition to declare bankruptcy during its run. Many blamed the low attendance on the fact that it was staged just two years and two states from Knoxville's 1982 World's Fair, and because it coincided with the 1984 Summer Olympics in Los Angeles. Others may believe that the 1982 opening of Walt Disney World's EPCOT Center may have also drawn more people to Orlando, Florida. There has not been a World's Fair in the United States since the exposition in New Orleans as of 2019. U.S. Navy's host ship for the 1984 World's Fair was USS Stump. The state of Louisiana spent $5 million on the fair; that amount was overseen by Ralph Perlman, the state budget director, who tried to obtain maximum use of the funds. An 84-acre (340,000 m2) site along the Mississippi River was cleared of rundown warehouses, replaced by the structures of the Fair. This was to be a "Class B" exposition as defined by the Bureau International des Expositions (BIE), the international body governing world's fairs. There were no major exhibits such as had been seen at the 1964-65 New York World's Fair, which started predictions that the fair could be a flop. Although 7 million guests toured the fair, it was not enough to recoup the $350 million spent to host the event. Paychecks started bouncing, and it was only through government intervention that the gates remained open through the scheduled run. The fair drew 30,000 fewer people in the first month than was predicted. One of the fair's more famous attractions was the Mississippi Aerial River Transit (MART). This was a gondola lift that took visitors across the Mississippi River from the fair site in the Warehouse District to Algiers on the West Bank. Also on display was the space shuttle Enterprise. The Fair was held along the Mississippi River front near the New Orleans Central Business District, on a site that was formerly a railroad yard. While the Fair itself was a financial failure, several old warehouses were renovated for the fair, which helped to revitalize the adjacent Old Warehouse District. The fair suffered from poor attendance, but many New Orleanians have fond memories of their fair experiences. 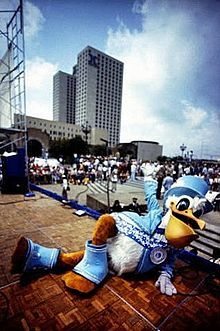 Highlights included a monorail, a gondola across the Mississippi River, an aquacade, an amphitheater for concerts, the Wonderwall, and the mascot Seymore D. Fair (also commonly spelled Seymour D' Fair). There also were many dining choices, including the Italian Village, the Japanese Pavilion and Pete Fountain's Reunion Hall. USS Lexington visited the fair and was open for tourist visits while much of the crew enjoyed liberty. Some traces of the fair remain today. In the Warehouse District, many of the streets were improved and many old buildings were renovated for businesses that hoped to cater to fair guests. These buildings later were converted to commercial and residential uses. These improvements paved the way for the city's arts district seen today. The Riverwalk Marketplace and the Ernest N. Morial Convention Center is perhaps the fair's greatest legacy. The exhibition hall of the convention center was the fair's Louisiana Pavilion, it later reopened as a convention center in 1985. Next to the convention center on the corner of Tchoupitoulas and Henderson streets is a steel and fiberglass bust of Neptune and the head of one of his alligators. At the fair, the statues of Neptune, a mermaid and some alligators surrounding them made up Bridge Gate, one of the entrances to the fair. Most other structures and the MART were demolished after the fair closed. The monorails were moved to Florida and re-used at Zoo Miami. Despite its problems, the fair is fondly remembered by many New Orleans residents, particularly for its noteworthy post-modern architecture, such as the groundbreaking Wonderwall designed by noted architect Charles Willard Moore and his partner William Turnbull. On November 11, 2014, on the Fair's 30th Anniversary, a large bronze commemorative plaque was unveiled at the corner of Julia Street and Convention Center Boulevard, the heart of the world fair site. ^ Pelle, Findling. "New Orleans 1984". Encyclopedia of World's Fairs and Expositions. p. 361. ISBN 978-0-7864-3416-9. ^ a b c Pelle, Findling. "New Orleans 1984". Encyclopedia of World's Fairs and Expositions. p. 360. ISBN 978-0-7864-3416-9. The insolvency of the 1984 World's Fair owner, Louisiana World Exposition, Inc., caused some subcontractors involved in the construction of the fair to sue the general contractor for payment of contract prices. Southern States Masonry, Inc. v. J.A. Jones Const. Co., 507 So.2d 198 (La. 1987). Even though there was a clause in the contract stating the subcontractors would be paid on the final payment by the owner to the general contractor, the payment provision did not constitute a suspensive condition that negated any obligation on the part of the general contractor until they were paid by the owner. The important issue was that the contract stated payment would occur "when" the general contractor was paid, not "if" they were paid. ^ "Ralph Perlman". Baton Rouge Morning Advocate. Retrieved May 31, 2013. ^ Cotter, Bill (2008). The 1984 World's Fair. Charleston, South Carolina: Arcadia Publishing. p. 120. ISBN 0-7385-6856-2. Wikimedia Commons has media related to 1984 Louisiana World Exposition.